This page contains a translation into English of the lyrics to the popular Israeli song "Zemer Atik", which is often used for folk dancing. Also included is a transliteration of the Hebrew lyrics into the Roman alphabet so you can sing along if you like. The song title is sometimes spelled as "Zimmer Atek", and sometimes the song is referred to by the title "Nigun Atik". The folk dance that people do to this song was choreographed by Rivka Sturman. According to Dan Ronen, Sturman lived at a kibbutz in Israel, which was a collective community. As she walked along a path there one day in 1942, she heard children dancing to the tune of a German song. 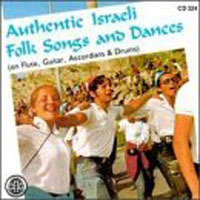 At the time, it was common for immigrants to Israel to continue using the music and dances of the countries they came from, which were mostly Slavic and Balkan. It struck her that the nascent nation of Israel needed to have its own music sung in Hebrew and dances to go with it. As a result, she decided to choreograph the first dances that established the style and character of Israeli folk dance as we know it today. She created her choreography to Zemer Atik in 1956. Today, Zemer Atik is often taught as an audience participation by folk dance clubs when they present programs to the public. It is simple to learn, even for non-dancers. It is also popular as a circle dance at Jewish weddings, with the bride and groom in the center.